Disclosure: This review was made possible by iConnect Influencer Management, Febreze and Swiffer was compensated for my participation in this campaign, but all opinions are 100% mine. Fall is the perfect time to give your home and car a mini-makeover. Bring some organization to your life! The chaos of the holidays is right around the corner, prepare now. The trunk of our mini-van has been bothering me lately. 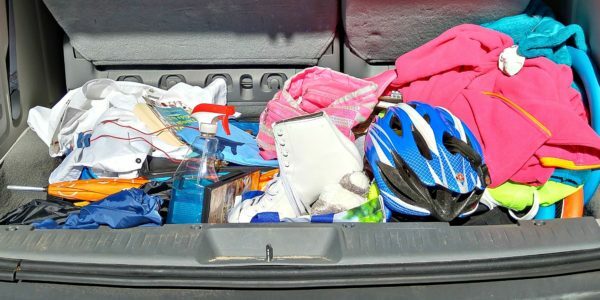 I call my car a “rolling closet” for my daughter’s clothes, shoes, boots, and sports gear. It can get really crazy and this morning I decided it was time to organize my trunk! Okay, no one is listening, be honest! Have you ever opened the car door and made a “stank-face” because it smells horrible?! You can tell me, I think we have all been there. Well, thankfully Febreze to the rescue. Use Febreze Fabric Refresh for the carpets and mats. Even fabric seats. It’s perfect for hard-to-wash fabrics throughout your home and car. 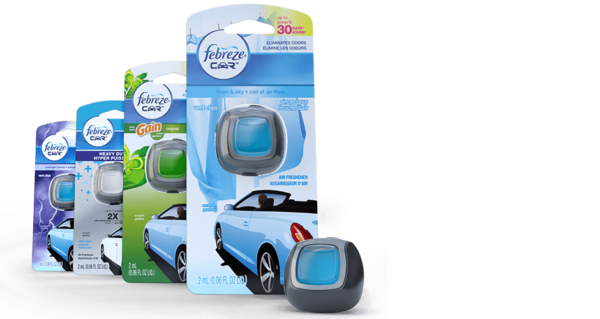 Then pop in a Febreze Car Vent Clip for continuing odor elimination, up to 30 days! Check out my trunk “Before” picture! Yikes, what a mess. But by putting in an organizer to catch all the hats and jackets, I contained the clothing mayhem. String bags worked perfectly to store sports and activities gear. It even makes it faster and easier for my daughter to grab-and-go when she gets to games or classes. Win, score! 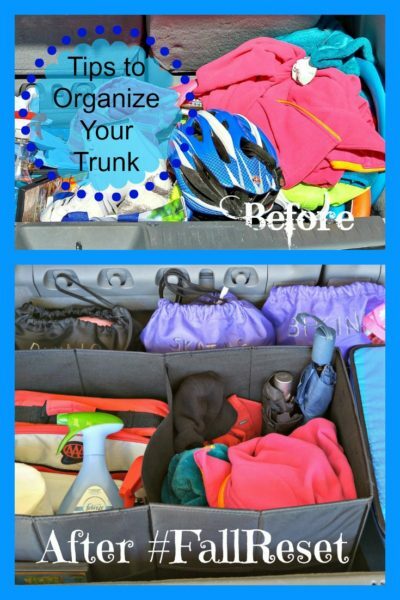 Organize your car or minivan with a place for everything (and everything in its place). Use a collapsible car organizer to store the toys, clothes, etc. that end up filling your trunk. Use Febreze Car Vent Clips to continuously reset and refresh after a summer of camping trips, games, and fast food meals-on-wheels. If you are thinking about taking on a big project to get your home ready for holiday parties, fall is a great season to make the switch to hardwood floors. We did a few years back and I have to say, I love it. The house feels cleaner and fresher to me. Finished wood and laminates are sleek, trendy and , with the help of Swiffer’s newly reformulated WetJet, easy to care for. When I first got my wood floors, I was hesitant to use anything wet on them, but with a child, a dog, and a husband (okay, I spill just as much as they do! ), dry cleaning just doesn’t do enough. Newly formulated Swiffer WetJet solves the challenges of beading liquid cleaners that case streaking and hazing. It’s safe for cleaning virtually every finished wood floor type. Has your house been sealed tight over the summer to battle those ninety-degree days? Febreze Fabric Refresher can eliminate musty odors from your closet, furniture, and more. Use it get make the inside of your home as crisp as the autumn weather outside! We have hardwood floors in our kitchen and that’s where we get the toughest mess. Right in front of the refrigerator is one of the worst. Dry mopping just won’t clean up food messes. That’s where Swiffer WetJet comes to the rescue! My living room is decorated in black-and-white, but then I add accents especially to reflect the seasons. This summer, I had a “beach-theme” with shades of blue and beach-y accessories. When September rolled around, I packed up all the beach decorations and pulled out the warm goods, soft browns, and dark reds. Fall is here and the colors reflect that. Do the same type of switch up with the scents you use. Febreze Fabric Refresher, Candles, Air Effects, and NOTICEables are available in their new Big Sur Scent. Vibrant. Citrusy. Spicy. Febreze Big Sur has a perfect balance of jasmine and cherry for all the noses in your family! 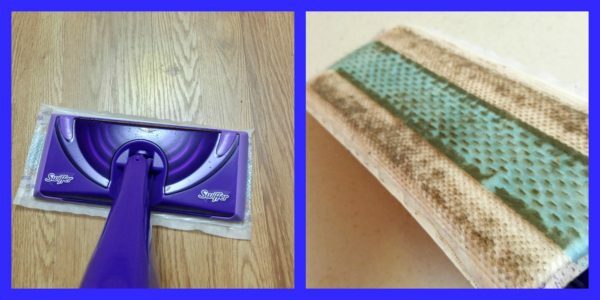 Enter to win your own Swiffer and Febreze products! We get high humidity where we live, so we typically keep the windows closed and air conditioner on all summer. Nothing beats the cooler weather when I can open the windows and bring the fresh air back into the house (the same goes for spring, once it’s warm enough from winter to open windows). I always sleep my best on a day when I’ve had the windows open and have aired out the stale air of summer or winter. 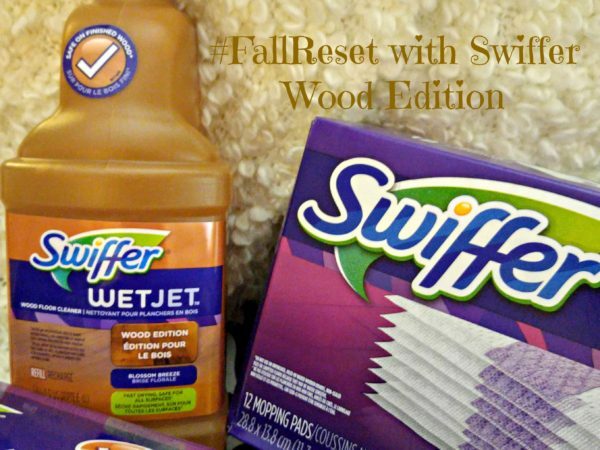 I love Febreze, and the Swiffers Products! I know what it’s like to have the stank face as soon as I opened the door to my car. I love ❤️ the GREAT Smell of Febreze when you spray it all through the vehicle. I absolutely love the Hawaiian Aloha kind that plug right in the vent. I love everything to do with the Febreze Fabric Freshners not just for my vehicle but everywhere in my house. As for the Swiffers, I can’t live without them. I love the smell of the Swiffers with Gain scent. What can you not say about Febreze and Swiffers, they are the BEST Products ever made. From the Sprays, Plug Ins, to the Floor Cleaners, and to all kinds of Dusters. We use air purifiers in the fall to keep out the huge amount of pollen we get off the trees, even when we open the windows for fresh crisp Fall air. My favorite Fall tip is to air out the house and clean thoroughly. My favorite tip is a tie between Tip #3 Eliminate Musty Odors & Tip #4 Food Fumbles since I have animals and a teenager these are both an issue in my house. I love my Swiffer Wet Jet and Febreze Fabric Refresher. My fall reset is to turn off the AC and open the windows to let the fresh air in. My favorite Fall Reset tip is to clean out closets, clean windows and open the windows to let the fresh air in. If allergies aren’t too bad, open windows to air out the house. We use a lot of candles and plug ins to help with closed in smell when we can’t open windows. My Shark mop just died and I am looking into the Wet Jet. I definitely plan my scents in the house around the season and mood. For the fall months I don’t like anything spicy. I like crisp smells like apples and the different autumn scents. My favorite tip is the food fumbles. 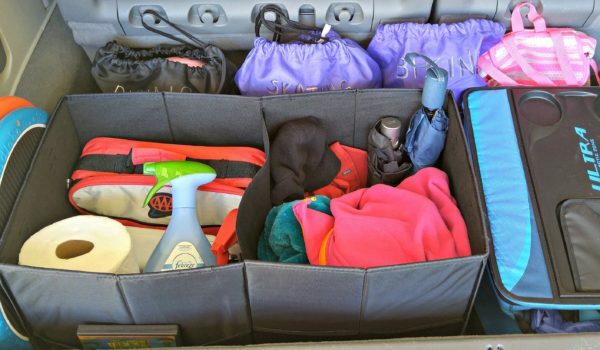 My favorite tip is using a collapsible car organizer to store the toys, clothes, etc. that end up filling your trunk! I open all the windows and let my house BREATHE! Myf avorite tip is #1 Tame Carpool chaos, something i need to do. I feel so embarrassed whenever anyone gets in my car. I always take out my screens spray them with scrubbing bubbles bathroom spray and hose off takes all the dirt and spider webs off. Clean patio furniture also with it no scrubbing just hose off. Clean air filters to furnace. Wipe down all vertical blinds with swifter dry pads work great! My favorite #FallReset tip is to open my windows and let the fresh air in. Also I love to add candles and scented oil plug ins around in the house. Washing the curtains and cleaning the carpets! Just like in the Spring, I do a full house cleaning. Walls, carpets, curtains, etc. I like to tackle one closet a week by pulling out things to donate to charity and then cleaning and reorganizing the closet! I like to use an air purifier, and clean out closets by pulling the winter items out and summer items in the back. I love the crisp cool air. I like to air out my house when the air conditioners are put away! I love, Love, LOVE anything apple! I love when my house smells like apple and cinnamon from baking. I love all the tips but my fave is #1 because my car really needs a fall reset! I love to turn off the air conditioner and open up the windows for fresh air. I love to open the windows to get fresh air. My favorite tip is Tip #2 Goodbye Shag, Hello Swag. We removed our carpet about a year ago and I love it! My favorite tip is to open doors and windows to let fresh air in! My tip is do some deep cleaning and donate old things. I like Tip #2 Goodbye Shag, Hello Swag. Thanks for having this giveaway. Since the weather is cooler I take advantage and do a big cleaning with the windows open to air out the house. It’s nice to start fresh before switching out to heavier sheets and blankets for winter. My #FallReset tip would be to deep clean the house. Nothing is better than a clean home! My favorite #FallReset is to open the windows and air the house out. Then I wash everything; bedding, throws, dog items, rugs, etc. Clean and scrub the bathrooms, kitchens, vacuum and dust. It is Fall cleaning, yay! My #FallReset tip is to wash the windows (I want to see when the snow starts) and clean the carpets. #FallReset tip…organize the shed and have winter supplies ready and summer stuff put away. The besty fall reset is to give the house inside and out a good thorough cleaning. Donate all unused items! I use diffusers throughout the house to get rid of smells. My #FallReset is to clean all the windows and My closets. Opening up the windows and air out the house and clean carpets!